The Upper Peninsula stands above the rest of Michigan on the map -- and above the rest of the state when it comes to property value trends. From 2007-11, nine of the top 10 counties seeing a percentage increase in property value (residential, commercial and industrial) came from the part of Michigan north of the Mackinac Bridge. Why? Well, it may be the age-old maxim in real estate: location, location, location. Marquette, the U.P. 's largest city, is 470 miles from the auto epicenter of the state, Detroit, which has fallen on hard financial times in recent years, to put it lightly. That distance from the Motor City might have shielded U.P. property owners from the highs and lows Michigan has seen, said Jackie Lykins, deputy director of the Marquette County Equalization Department. "When the bubble burst," she said, "we didn't have that far to fall." Lykins added that the economic downtown didn't affect the Upper Peninsula the way it affected the Lower Peninsula. "We don't have any real tie-bar to the auto industry, where areas downstate were affected by the types of things we weren't," Lykins said. Marquette, she said, also has the advantage of being home to Marquette General Hospital and Northern Michigan University, while nearby Marquette Township has seen recent construction of large stores such as Lowe's and Best Buy. Marquette also has been the beneficiary of good publicity lately, with Money magazine naming the city one of its "Best Places To Retire" in the October 2011 issue. That's leading to people returning to the area in their later years, Lykins said. "That's what they always wanted to do, and we've seen that," she said. Carol Stevens, a real estate agent with Century 21 in Marquette, agreed that the city being bike-friendly and a good place to retire -- along with its scenic beauty and waterfront development -- help property values. "All that contributes to the desirability of this area," Stevens said. Down the road in Menominee, Peggy Schroud, equalization director of Menominee County (also in the top 10 for value growth), suggested also that geography helped protect the area from the economic gyrations seen in the Lower Peninsula. "Maybe the industry downstate has more of an impact on things than up here, because we're not based on that high manufacturing like they are downstate," Schroud said. Being on the Canadian border is a big factor, she explained, with the Soo Locks, a Coast Guard sector, Lake Superior State University and the Sault Ste. Marie International Bridge aiding the local economy. "Chippewa County is just an excellent area to invest," Kennedy said. 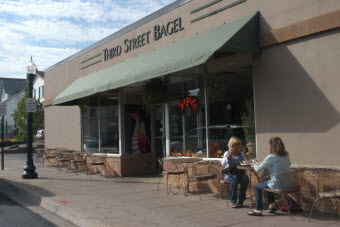 Cristal Silta, owner of Third Street Bagel at in The Village, a quaint shopping district in Marquette, said she's seen the difference between the immediate surroundings and what has gone on downstate. "We really removed from it," she said. "We didn't have the benefit from it in the first place, so we didn't feel the loss." Her business had an SEV loss of $12,700 from 2010-11, Silta said, but had increases the three previous years. Silta, who also owns rental properties, said, "Everything's fine. I don't feel like my property values have gone down at all." According to the last census excepting Marquette almost all of the counties in the UP experienced a 5 to 10% population decline! It is simply not possible to have an appreciating real estate market in the face of this type of decline in demand. I'd question the entire premise and quality of research for this article. If you look at the Bureau of Economic Analysis data for Michigan Counties from the U.S. Department of Commerce, you'll see that population, personal and per capita income increased slightly from 2008 to 2009 in many UP counties, the most recent data available and representative of the worst of the economic downturn. http://www.bea.gov/newsreleases/regional/lapi/lapi_newsrelease.htm While the increases are modest, they are consistent with a more stable real estate market . 2008-2009 isn't a trend. http://quickfacts.census.gov/qfd/maps/michigan_map.html Maybe the poor economy everywhere else is slowing down the 50 year UP exodus, but I doubt that's any reason to cheer. And given that higher ed and health care are two of the biggest bubbles out there I wouldn't base investing in real estate on them.